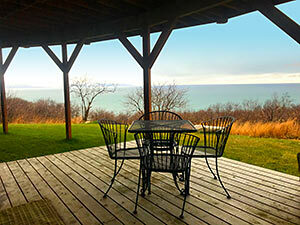 The RavenGuesthouse has Stunning Views & a bathroom for each bedroom. 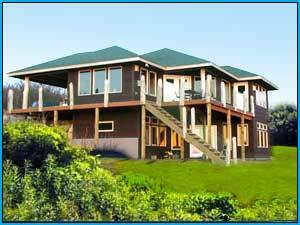 This bluff property holds a 2400 sq ft custom 3-bed/3½ bath house that can easily accommodate 6 - 10 people. Each bedroom has an incredible view, its own bathroom and has either 2 single or 1 king sized bed so it can accommodate couples or singles. 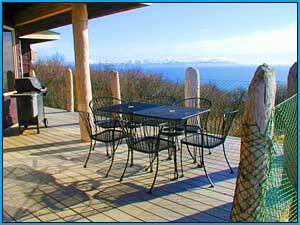 It has a 180-degree view of Kachemak Bay and the Alaskan Mountain range. It's large yard has a fire pit and picnic table as well as a big deck with a Weber Grill. 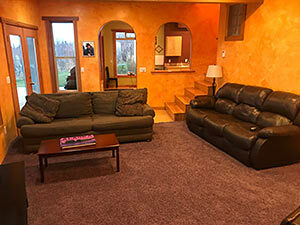 Inside its open floor plan is a comfortable place to enjoy each other’s company. The Lookout Apartment is a little slice of Heaven. Iit is located in the lower level of my 4500 sq. ft home it has its own private entrance, it has 2 bedrooms that can have 2 single beds or we can push them together and make a nice big King size bed so we can accommodate singles or couples. 1 full bathroom, with full kitchen, living room with 3 couches one that folds out in to a hid-a-bed for that extra guest, washer, dryer, nice big deck with a nice big Bar-b-q and a big yard with a fire pit.